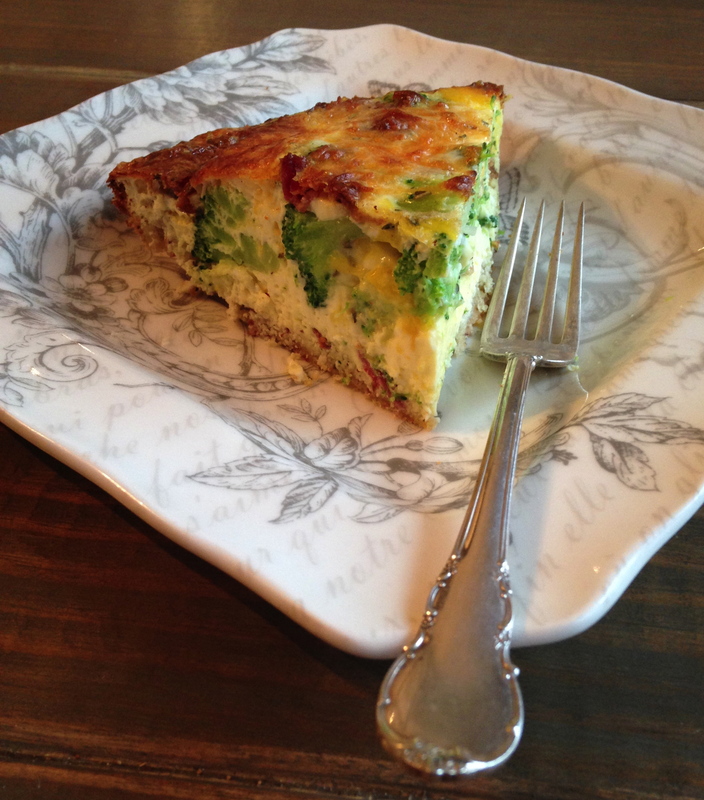 It’s a cold, rainy day in Texas and my hubby had the day off, so while he took my son to Cabela’s (a favorite rainy day outing around here), I decided to work on my quiche recipe. For years, I have tried to find an awesome recipe, and they never came out right…often watery or just not very yummy. But today I made the best quiche of my life! I was looking at recipes I’ve used before and they all called for more liquid (in the form of half and half or heavy cream) and less eggs. So I decided to switch things up a bit and voila. Quiche success. Grease your pie plate and set aside. Combine the almond flour, rosemary, baking powder salt and garlic powder in a large mixing bowl. Whisk the egg, oil and water in a small mixing bowl. Add the egg mixture to the dry ingredients and stir together well. Press dough into the pie plate and set aside until you are ready to add your quiche filling. Preheat oven to 400°. In a large mixing bowl, whisk eggs, half and half and spices together. 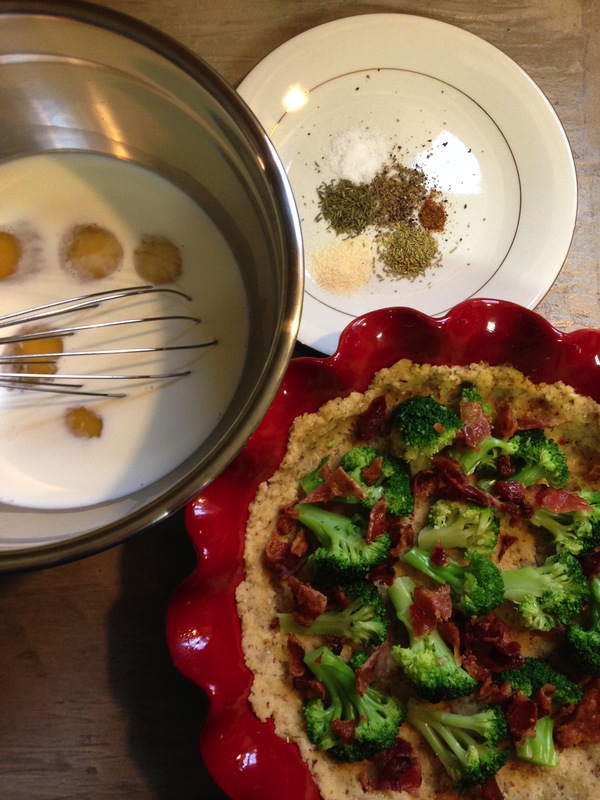 In pie plate with dough already pressed into it, place broccoli and bacon evenly. Sprinkle cheese over the broccoli and bacon. Pour egg mixture on top. Bake quiche in oven on 400° for 15 minutes, then reduce heat to 350° and bake for 30 more minutes. At this point of lowering the temperature, place a sheet of aluminum foil loosely on top of the quiche to keep from browning too much on top. Remove from oven and allow to sit 5-10 minutes before slicing and serving. Enjoy! I ate a slice of this alone today, but isn’t there just something about lunching with some girlfriends and enjoying a yummy quiche together? *This recipe is low-carb and gluten-free. The spices, veggies, meat and cheese are all optional or changeable…switch these out for different variations! 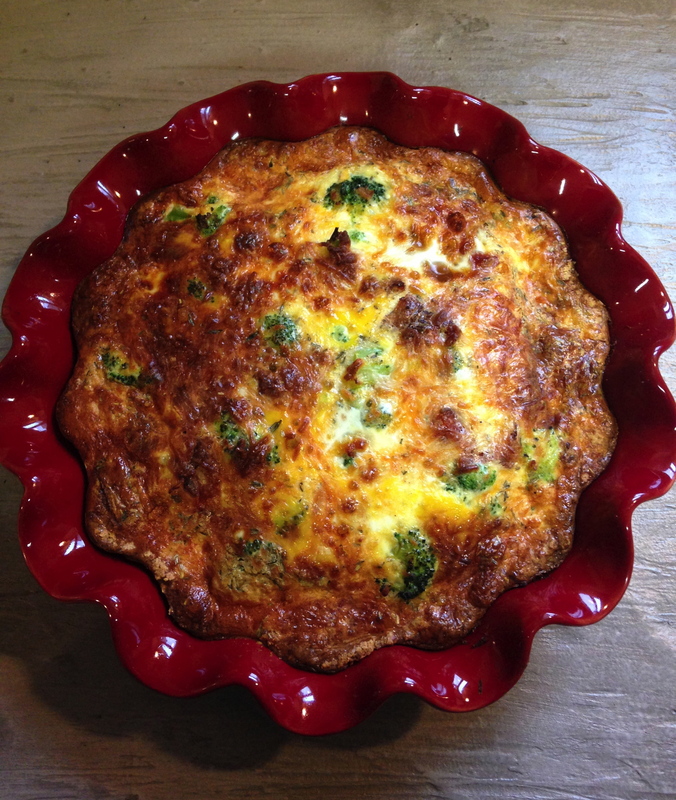 Tags: almond meal crust, gluten free, gluten free crust, healthy eating, low carb crust, low carb pie crust, low carb quiche, low glycemic recipes, S meal, THM crust, THM pie crust, THM quiche. Bookmark the permalink.